With the dedication of our distinguished professionals, we have gained expertize in manufacturing, supplying, exporting, distributing and wholesaling of a wide array of Folding Tables. We manufactured these tables in accordance with the specifications of the clients so as to ensure maximum level of patron-satisfaction. These products are acclaimed int the markets all over the world for their quality as per the international standards, prolonged service life, customized designs and high comfort in sitting. 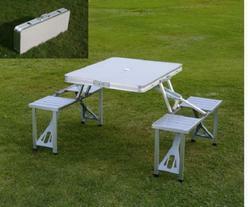 To fulfill the demands of the clients, our firm is offering a remarkable array of Aluminum Folding Tables. The offered range is highly appreciated in the global markets for their excellent design and high comfort. We manufactured all these products using finest grade aluminum with the help of diligent professionals. All these products are provided to the clients within the affordable price range and with assurance of timely delivery. Packaging Details: As per order to our for Chennai Other Than Chennai Send Via Transport. including Delivery Charges. Looking for Folding Tables ?